Rethink your employee engagement strategy with this list of fresh ideas and approaches, designed to give seasoned employee engagement teams and their impact a big jolt. We’ve surveyed our employees for the last 3+ years. Leadership and manager support is waning. Following the survey, nothing really happens. We keep surveying, but see declines in results. Employees are starting to doubt the process. We’ve got this down pat. What’s next? If two or more of these apply to you, don’t wait a moment more; download this ebook for a breath of fresh air! 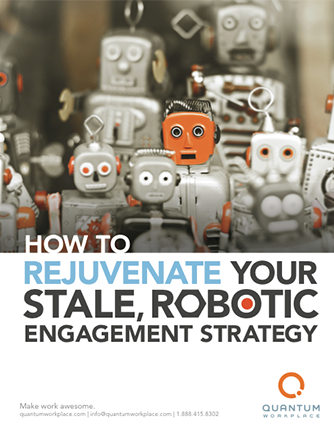 How to Rejuvenate Your Stale, Robotic Engagement Strategy is packed with more than 25 ideas on how to revive your employee engagement program.